Starting about 2 miles from Keksholm and up to Serdobol the shore is made up from the thick, high, hilly skerries. All the shore is a continuous line of narrow bays, coves and inlets. Settlements in these places are all inside the skerries and none could be seen from the lake. But at the apexes of all long bays, penetrating deep into the mainland one always finds settlements, some of them are rather large. At the apex of the Krounborg bay there is a Krounborg settlement. It has a Kirk with two priests (one of them is a probationer) and excellent grange with all necessary extensions. Several local merchants hold small shops here. Ships with the goods come to Krounborg and get here shipments of willow bark. Jakimvari sits at the apex of the Jakimvari Bay. It is also rather a big settlement, with very nice stone Kirk, Post office and shops with different agriculture products. Nearby there is Lahenpohja village. Jakimvari Kirk is seen from quite a distance from the lake, if to look along the bay. A couple of young people were mach in love with each other. But as the young man was very poor, the girl's family was strongly against their marriage. They made it so that the young man was sent somewhere far from the home and kept a girl under strict control at home. The young beauty was very upset and in the one bad weather night managed out from the house and dived into the bay from one of it's high rocky edges. She became an Impi – kind of nice, well-looking mermaid. Every midnight this creature came up from the depths and played in the water as if calling someone and then gave a terrible cry. The local echo took this sound far away, terrifying all the neighborhood. The parents of the dead girl were so much upset that soon died. Her fiancé lost somewhere. After such a sad event the local inhabitants gave the bay the name Impi Bay (Impilaks in Finnish). On the mainland, at the mouth of Impilaks bay, on quite a high place there is Hunuka village, seen far from the lake, as it is not hided by skerries. On from this place goes a rather high shore called Pitkerando. The word "Pitkerando" in Finnish means "long shore" and the name is given probably because the skerriish shore ends here and the shore goes on the South-East without bays, inlets and capes. The same name – Pitkerando – bears the place where now stand copper and tin mills and the mines that cut the ore for them. The shore in this places is the rock up to 150 feet high. Quite near the shore on the space of no more than a mile there are 6 mines. The first is about 80 feet over the water, other (to the North-east) go higher. The first mine gives tin ore and it has a steam engine for lifting the ore and pumping out the water. There is a building near it where many boys crush and sort the ore. The second mine is just 200 yards from the first and they cut copper ore there. It has nearby a building with a steam engine that also used for crushing the ore and sizing out black tin ore sand, that has about 45% of pure tin in it. The size goes directly to the tin-stoves. Copper and tin ores were found here already in 1770, but mining started only from 1820. From that time mines were changing owners several times and only in 1847 the Pitkerando Company got the full share on them1. For all the time mining was done quite insufficiently, wildly, what can be seen even now and though nowadays they get up more ore and produce more metal it does not tell one that Pitkerando mills are in a good shape. They say that Pitkerando copper is quite good but difficult to fuse and a bit too brittle when stretched to sheets. The tin is also quite good and is being cast into English kind thin bars, but still it might be purified better. The given numbers show that Pitkerando mines are rather reach, but the use or the most reach veins, large volume of sized out material and, sometimes, volume metal production does not add to the price of the mines as any visual rise of production is forced and brutal. This shows that attempts to enforce metal production will soon use up most valuable veins. It might be approved by the fact that despite quantity and value of produced metal several mines are abandoned already. The Pitkerando mills sometimes gave jobs to up to 2000 workers, but sometimes they were only tenth of this number. In 1866 the mills were stopped altogether and all the equipment sold out. At present Pitkerando mills are producing something again. Thick hilly skerries end near Pitkerando. The mainland from it to Manchin-saari Island goes more strait. The most interesting settlements here are Ila-uksu and Ala-uksu. The first is at the river with the same name and has a church. The second is on the cape. Ila-uksu has a saw-mill with the timber floating from the places far to the North and the saw-timber goes to Sankt-Petersburg. Next comes villages Liran-kula and Usi-Kula, places on the high shore and seen far from the lake. Next, nearby Tuloma River, goes rather interesting place called Salmis or Salma. Salma is quite an interesting place at the North-Eastern corner of the lake near the border of Olonets Gubernia. Nearby Salmis at the mouth of the small river there is rather a big village Minola. This is fisherman's village and one can see a lot of small boats on the beach. Next, near the Karkun-lamp Lake, there is Karkula village where main occupation of the inhabitants is also fishing. Then at the high shore near the border with Olonets Gubernia and quite near Pogranichnye Kondushi village there is Manshilla village. It stays near big road and its inhabitants make living by agriculture and, partly, by fishing. On the islads at the North-Eastern corner of the lake there are several settelment: Giva, Vorta-gozha, Peremo, Staraya Myza, Ulaha, Umampe, Langula and some other villages and the custom post on Lungula Island, Tumbela, Tarkikula, Geremega, Hilala, Randakula and Leldonja villages on Manchin-saari or Manistky island. All this villagies bolong to Salmi parish and they are mainly fisherman's villages. On the othe islands in the Northern Ladoga, except Vaalam and Konevets there is no permanent inhabitants. On the Heinesima (Sennykh) Island there is a temporary lighthouse and a custom post. On Voschany Island, belonging to Vaalam monastery ther is a monastery guardhouse. 1. 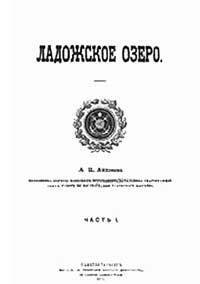 See "About Pitkerando mines" artixle by Tserebrikov in "MarineCollection" 1863, vol.5. 2. The first two years of the ones shown in the table the mine were directed by baron Ungern-Shtenberg, then by Mr. Shiryaev, from 1863 they are directed by Mr. Zhofrio.